Protesters have been camped outside St Paul's Cathedral since 15 October. Why are they there, what is the situation and how has it affected the church and its staff? When did the protest start? As part of a global day of protest on 15 October, up to 3,000 protesters gathered in the square outside the London Stock Exchange, near St Paul's Cathedral, with the aim of occupying it. Police stopped that from happening. The Occupy London Stock Exchange (OLSX) protesters then turned to St Paul's Churchyard, the square in front of the cathedral, planning to set up camp. Police initially said it would be "illegal and disrespectful" to camp in front of the cathedral, but they later announced they would not be moving anyone on from the site. By the third day, more than 100 tents were set up. The demonstration is an offshoot of the Occupy Movement, which began on Wall Street, and has seen protesters taking to the streets across the world to rage, albeit peacefully, against greed and inequality. Protesters in London say every country has its own national focus, but here the spotlight is on economic inequality, social injustice, corporate greed, and a lack of transparency and accountability in the City. Demonstrators have said they want politicians to listen to the people and not to bankers. On the OLSX website, an initial statement, which the group says was agreed by all 500 protesters, states nine key reasons for the demonstration. It includes the points that "We refuse to pay for the banks' crisis" and "We want structural change towards authentic global equality. The world's resources must go towards caring for people and the planet, not the military, corporate profits or the rich." However, it has also become clear that OLSX is a disparate group that represents a number of different opinions. Some describe themselves as "anti-capitalist", while others say they are not anti-capitalist but do see a need to stand up against corporate greed. Others describe the need for a complete overhaul of the financial system in Britain. The group, which has maintained it could stay outside St Paul's until Christmas, states on its website that it hopes for a "future free from austerity, growing inequality, unemployment, tax injustice and a political elite who ignores its citizens". How has the church reacted to the protest? BBC religious affairs correspondent Robert Pigott said St Paul's had been caught in a difficult position because the Church has previously spoken out vociferously against corporate greed. One senior church figure was quoted in the Guardian as saying that the church's response had been "a total and complete shambles". The Chancellor of St Paul's, the Reverend Canon Dr Giles Fraser, initially said he supported the right to peaceful protest and Sunday services were continuing as normal. But, just a day later, warnings were sounded from the church that the camp posed a health and safety risk, and in the coming days the church closed and the protesters were asked to move on. Since then there have been several high-profile resignations, including that of Dr Fraser. Our correspondent said that now the Bishop of London, Richard Chartres, had taken over the running of St Paul's he expected to see a harder line from the church. "He (Dr Chartres) intends to shift, in his own words, the attention from the camp to the economic situation and I think probably try to put a bit more moral pressure on the people outside the cathedral and to make them take more responsibility," said our correspondent. Meanwhile, the Archbishop of Canterbury has said the protesters, who are opposed to "corporate greed", had raised "urgent issues". "We need - as a church and as society as a whole - to work to make sure that they are properly addressed," said Dr Rowan Williams. Have the church taken legal action? Yes, St Paul's Cathedral and the City of London Corporation decided on 28 October to take legal action to evict the protesters. The corporation's planning and transport committee voted to proceed with court action to remove tents from the public highways by the cathedral. On 31 October, the corporation confirmed that a letter would be served to protesters on Monday afternoon, ordering them to leave within 48 hours. If the protesters did not comply the case would go to court. What has been the impact on church staff? Since the protest began, the canon chancellor and dean have both resigned. Canon Chancellor Giles Fraser, who was sympathetic to the protesters, quit on 27 October. Dr Fraser headed the teaching office at the cathedral, and his role was partly as Canon Residentiary, concerned with engagement with the City of London. Later, part-time chaplain Fraser Dyer resigned. The dean of St Paul's Cathedral, the Right Reverend Graeme Knowles, resigned four days later, saying his position had become untenable. He had held the post for four years. What has been the impact on the church building? The church closed to visitors on 21 October - one week after the protest began - because of health and safety reasons. Sunday services were suspended until further notice but small gatherings of up to 100 people were still be allowed inside the church to enable planned weddings to go ahead. It was only the second time Sunday services had been cancelled - the other time was during World War II, when the cathedral was closed in 1941 for four days during the Blitz. It reopened on 28 October although the dome and galleries remained closed. The reopening was overshadowed somewhat by the resignation of Dr Fraser, who said he feared evicting the protesters could lead to "violence in the name of the Church". Have the protesters reacted to the church decisions? When the cathedral first shut, the protesters said they had reorganised the camp in response to feedback from the fire brigade and accepted the presence of two large barriers to preserve access to the side door of the cathedral. 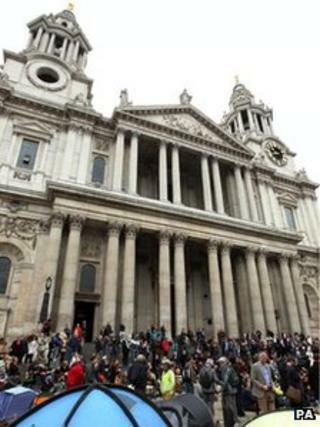 After the resignation of the dean on 31 October, Occupy London described the management of St Paul's Cathedral as "deeply divided" over its response to the protests. "But our cause has never been directed at the staff of the cathedral," it said. The protesters have said they are prepared to respond to any legal moves to evict them.